The key element of a successful follow-up visit for diabetes, whether Type I or II, is good record keeping, which equates to your logs! The minimum number of glucoses checked per day in this practice is two. Most patients check four to six times or more per day, which provides the basis for intensive insulin therapy, combination therapy, or treatment with oral agents alone. No matter which treatment is tailored for you, record keeping is critical! Preparation and organization are key elements of the successful diabetes follow-up! 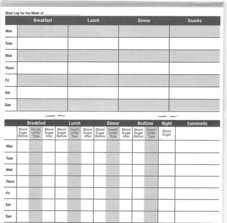 A sample glucose meter log is provided for you below. Simply click on it, copy it to your browser, and then you can enlarge and print multiple pages.